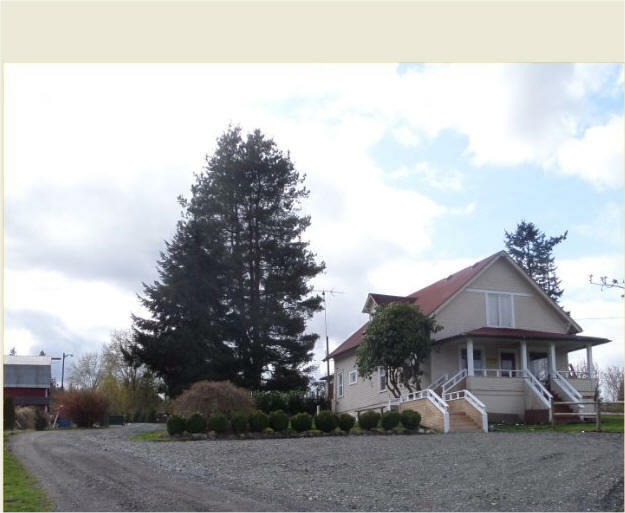 The NurseryTrees.com Office is in the old farmhouse at the front of our property, just to the right as you enter. Heading westbound you'll see our sign. Tuesday-Friday: 10:00 a.m.-3:00 p.m. by appointment only. Saturdays: 10:00 a.m.-2:00 p.m. by appointment only. Other appointment times are available by special arrangement. We are currently experiencing a very busy season. We do our best to keep up with calls/e-mails but thank you in advance for your patience. If you'd like to discuss a new project with us, please use our online Free Estimate Form. Note: We are a working farm. Paths can be muddy. Except in the dry weather we suggest you wear boots if you are going to walk around. Children are welcome--they will like our animals, electric carts, and rural atmosphere--but they need to be looked after carefully because this is a working farm with tractors and equipment, truck traffic, etc. Thanks. Coming from Seattle/Bothell/Redmond/Eastside/South of Seattle: From 405 at Bothell/Kenmore, take Highway 522 east towards Monroe . Stay on 522 for several miles, going through one stop light, and you will then cross the beautiful Snohomish River. Take the next exit ( Monroe, West Main St.). At the bottom of the exit go ¾ of the way around the circular "round-about" and head back under 522 going west. You will then come to a second "round-about"; go half-way around it and exit to keep going west. When you exit the "round-about" either stay or get in the left lane that leads to a stop sign. Go straight through the stop sign and stay on that road approx. 3 miles. Look for the white horse fence on the left with hundreds of trees behind it. Please go to the office in the old farmhouse just to the right as you enter the property--trucks/trailers use the lower parking lot in front, cars use the upper lot by the side of the house. See map & photos below. Coming from Everett/North: From I-5 in Everett, take Highway east 2 towards Monroe. Go several miles by all of the Snohomish exits. At the first stop light you come to (AM/PM Mini-Mart on left, just before Evergreen State Fairgrounds and the city of Monroe), go right onto Fryelands Blvd. Go 1 mile to the end of Fryelands Blvd. and at the stop sign, go right. We’re 3+ miles down on the left; look for the white horse fence. 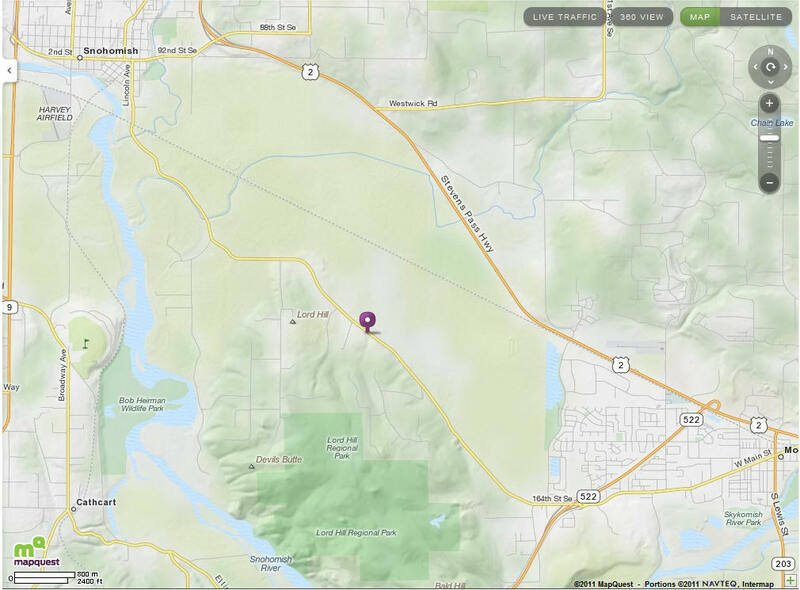 Coming from the City of Snohomish: We're less than 10 minutes from the City of Snohomish. Go south on Lincoln Avenue (at the main intersection of 2nd St. & Lincoln, there's a First Heritage Bank and CENEX). This takes you right past Stocker Soccer Fields, under the railroad trestle and then turns into the Old Snohomish-Monroe Road. 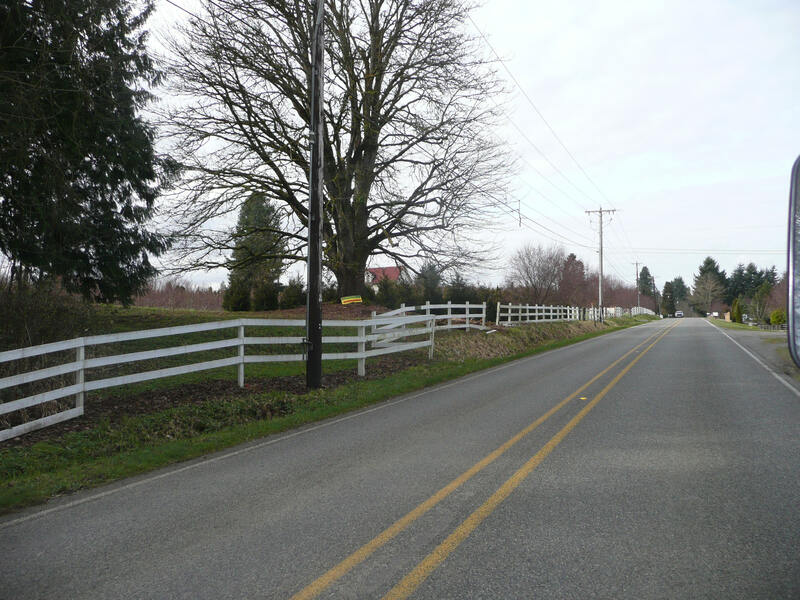 Stay on the Old Snohomish-Monroe Road for 3-4 miles (don't turn right to Craven Farms). You'll go up the hill out of the floodplain. We're on the right after a mile or so after that. Coming from the City of Monroe, Stevens Pass: We're less than 10 minutes from the City of Monroe. One easy way to get here: Main St. in Monroe turns into our road as you go west. Approaching Monroe westbound on Hwy. 2, Main St. is the first left after the bridge into town. Another way to get here--stay on Hwy. 2 through Monroe and turn left just after the Fairgrounds on Fryelands Blvd. (AM-PM MiniMarket on right). Go as far as you can on Fryelands and take a right at the stop sign. 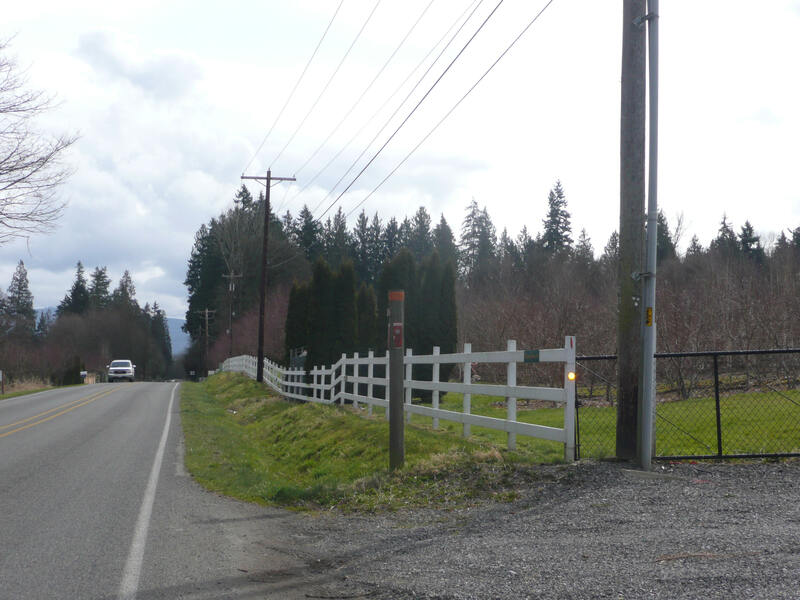 You are now on the Old Snohomish-Monroe Road. Stay on the Old Snohomish-Monroe Road for 3 miles or so. We'll be on the left. 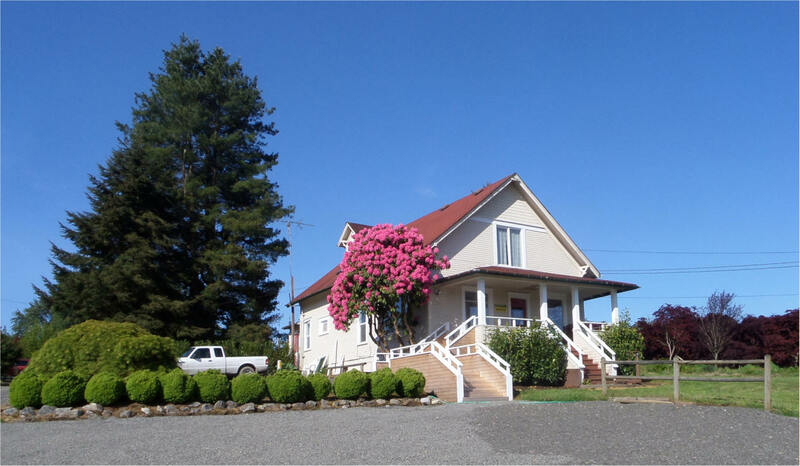 From the East (Hwy 522, Monroe) From the West (Snohomish) Look for wagon wheels Office is in the old farmhouse to the right. Look for the long white fence with hundreds of trees behind it. 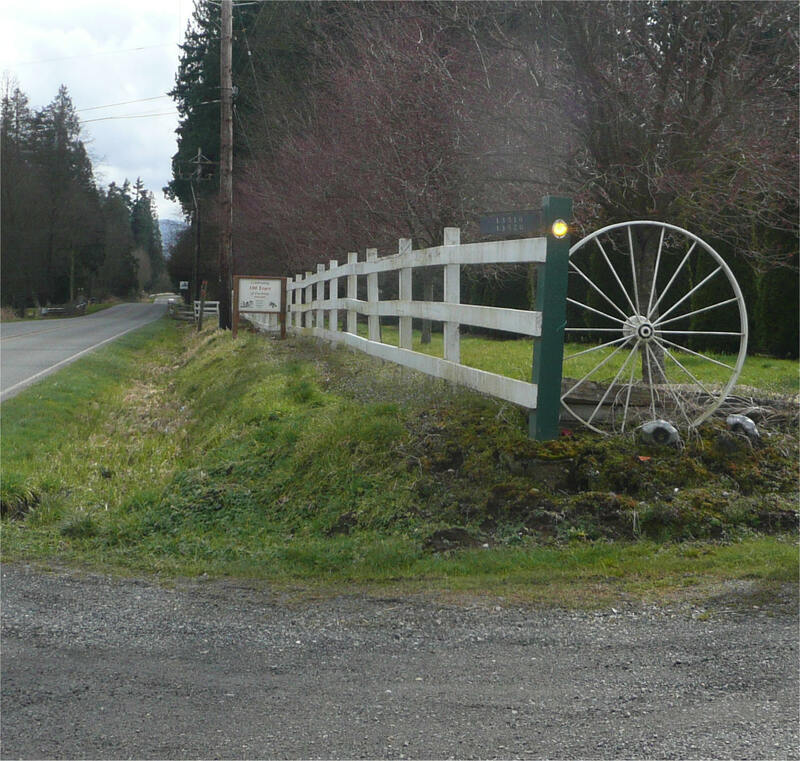 Our driveway has wagon wheels on both sides, when you come in stay to the left (follow the sign to the Office). 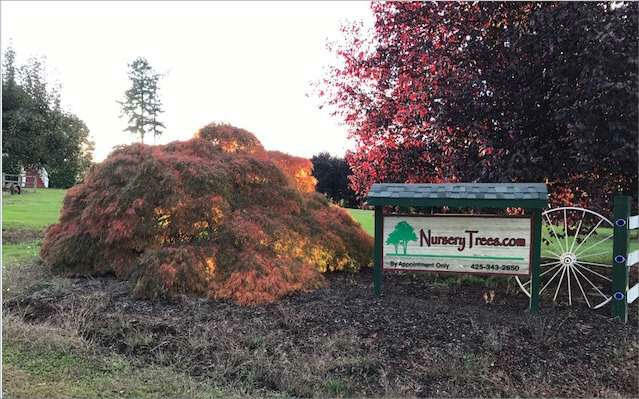 Or call/e-mail us: info@NurseryTrees.com (425) 343-2650.